The apartment (room flat on the first floor overlooking the sea), part of a building with several apartments, is located in the seaside village of Marinella di Selinunte and it can be reached on foot, services and stores the most important. Less than 200 m .: supermarket, bakery, pharmacy, medical, bars, restaurants, bank, fish market (sold directly by fishermen) and the entrance to the archaeological park. Dall 'apartment you have immediate access to the beach and the sea (which is only 20 m.). - Large terrace with sea view and view of the archaeological park of Selinunte. Dell'arenile on the stretch of the Mediterranean sea on which overlooks the archaeological park of Selinunte, rich in temples and majestic ruins of the most important Greek colony of the fifth century. to. C., there are the 'Terraces of Apollo', so 'calls for the close-up view of the Temple of Apollo. 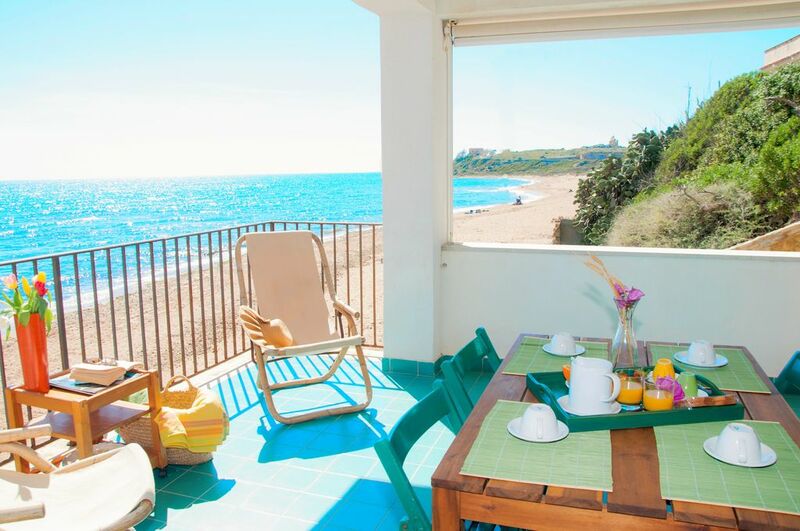 From the apartments you have immediate access to the beach and the sea (which is only 20 m.!). The 'Apollo' Terraces are characterized by different apartments (three and four) are located in the seaside village of Marinella di Selinunte and they are reachable on foot, the services and the most important outlets. Less than 200 m .: supermarket, bakery, pharmacy, medical, bars, restaurants, bank, fish market (sold directly by fishermen) and the entrance to the archaeological park. At about 1 Km. Is the entrance to the Nature Reserve of the Belice. Interesting species of birds live there and an interesting flora thrives (dwarf palms, ferle ...). - Double or twin room (sleeps 2) + bathroom; - Double room (2 persons) + additional bed (1 place) + bathroom; - Living room with sofa bed (2 places) + a cot (first place); - Third bathroom; - Kitchen with hob (4 burners), oven, fridge + frezeer, utensils, crockery + tea towels. -Terrace With garden table + chairs. - TV, Internet Access, possibility of camping cot. Lovely veranda and well-cared for apartment. This is a very well cared for apartment right on the edge of the beach towards the end of the village. The balcony/veranda is excellent for sitting out and watching the waves and admiring the ruins at the end of the archaeological park of Selinunte. It was sunny for most of our stay with a strong cold breeze, but the blinds on the balcony afforded some shelter so we could still sit out even in early March. As we stayed here in early March there were a lot of properties around that had closed for the winter and not yet re-opened for the season. This meant that it was very quiet and quite a secluded spot, but this may not be the case in summer. Giovanni the owner was very helpful, meeting us graciously when we arrived 4 hours later than expected due to flight delays. He appeared the following day with a plate of Sicilian speciality pastries for us to try. The living room is a reasonable size with the kitchen tucked into one corner. This iwas equipped with a kettle & microwave which we used and a hob/oven and pots for cooking (which we didn't). The 2 bedrooms are a decent size and furnished with all the basics. The bathrooms, of which there are 3, are compact and nicely finished, each with a toilet, basin, bidet and a fully tiled, spotlessly clean shower. One is very narrow and could be a bit of a squeeze for anyone with a large build. There were just 2 of us staying in the apartment which gave us loads of space. It is equipped for 6 but this could be quite tricky (unless 2 were smallish children). Thanks for the review, this is my way of serving the guests. My objective is to improve myself more and offer more services to guests. If you decide to return to my apartment you will be welcome. We agree with the other reviewers: it’s a lovely place for a holiday. It’s almost on top of the beach with spacious balcony overlooking the sea. We went early in May when the strong wind was unseasonably cool, but away from the wind the sun was lovely and warm. The shaded balcony would provide welcome relief in the summer. The kitchen is very small but we only used it for tea making and washing up after salad lunches on the balcony. We did no cooking otherwise as there was such a choice of restaurants on the doorstep. The accommodation was very clean, the free wi-fi was invaluable and the charming Giovanni was available to deal with all queries both before and during the holiday. We had no car but could easily walk around the town and to the archaeological site. The Euthalia agency by the harbour can arrange tours. Absolute sea front with view of temple! Wonderful place to relax and explore Sicilian history! Sleep comes easy when you can hear the lapping of the waves practically at the doorstep. Very well appointed apartment, with roomy spaces, beautifully clean and a gorgeous terrace which enjoys sun all day. Tasty and well priced food at the harbour front restaurants. Highly recommend this apartment - it will be a highlight of our stay in Sicily. I am very happy that my apartment and Sicily have been to your liking. I wish you a good continuation of your holiday in Sicily. I hope to see you again, perhaps next time in your beautiful Sidney! Stayed here for two weeks with the whole family (me, my wife and three kids: 3, 9, 11). The initial plan was to use it as our base for excursions throughout Sicily, but…when we sat out in the terrace the first morning, with the cup of coffee, it was simply breathtaking. The views were stunning and the sound of the sea magical. We decided immediately to change our plans and settle into the local community rather that driving a tens of kilometers around Sicily every day. And it was a perfect decision. We miss the food, the wine, restaurants, fish market, little shops and gelati. Wish we were still there!!! The apartment in itself was great inside, very clean and spacious (big enough for our family of five persons), decor was also very well done. Everything we needed was there. We definitely recommend it to all. We wish you all the best Giovanni, and we will definitely make very good publicity for you, here in Poland. "We stayed here for a week at the end of September and had a wonderful, very enjoyable break. The appartment is right on the beach and only a few feet from several good local restaurants. The spectacular archeological park (free entry on Sundays) can be seen from the balcony and is within walking distance as is most of the town and local shops. The appartment is comfortable and clean with three shower rooms and WC''s. It has a small but well equipped kitchen. The balcony is a delight and we swam once or twice every day. The owners were friendly and helpful. Thankyou." "Very nice, peaceful apartment, with direct access to the beach. If you are not searching for crowdy spa with a lot of hotel, you will like this apartment and location. I have already recommended it to my friends! Can be reached on foot, services and stores the most important. Less than 200 m: supermarket, bakery, pharmacy, medical, bars, restaurants, bank, fish market (sold directly by fishermen) and the entrance to the archaeological park. From the apartment you have immediate access to the beach (which is less than 20m!). At about 300 km is the entrance to the Natural Reserve of the Belice. Li live interesting species of birds and flora thrives interesting (palmettos, ferla ...), adjacent to the reserve is a pristine beach where you play (one of the few sites in the Mediterranean) the Caretta caretta sea turtle rare. The price shown above is the minimum price for 2 persons with increase of € 50.00 or € 100.00 for week for each additional person depending on the time required. The price is all inclusive with the exception of the provision of bed linen and towels for which you will have to pay an amount of € 10.00 for person for week.